When a consumer looks to book a ski holiday, they think about clear blue skies and white slopes. However, over the past few years, we have learned that there is no guaranteed there will be snow in Europe, and consumers have begun to want confirmation of snow conditions before booking a flight. For one of our Netherland’s clients ski holidays are an incredibly important part of their business. 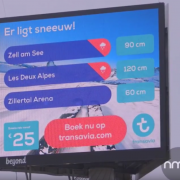 Transavia asked NMPi Netherlands to help them take advantage of the unpredictability of snowfall in top ski destinations where they fly. Traditional programmatic display campaigns are distributed regardless of weather conditions. What we looked to do if find an innovative way to entice the consumer with competitive pricing and the guarantee of snowfall. 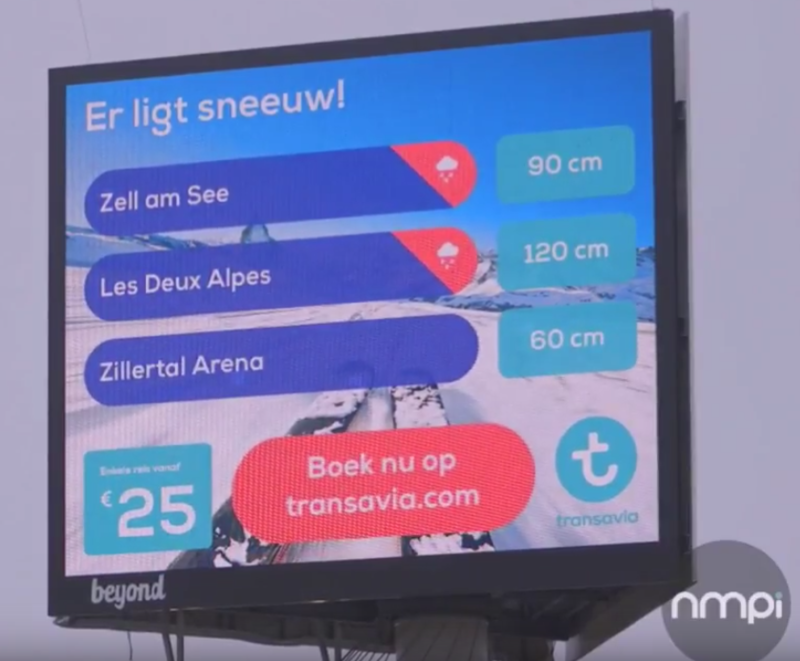 Our goal was to use technological advancements that allowed us to include snow heights at popular ski areas across Europe in our display ads, all in real time. With the help of weather specialist, Meteovista, we created a solution for Transavia that delivers real value to their travel customers. When fresh snow falls, Meteovista tracks the height in real time. The weather data is sent to Meteovista in the Netherlands, which is then shared with us, and entered into our database. This triggers the campaign across every platform (Display, Premium Display, Facebook and Digital-out-of-Home). Creatives are adjusted to show current snow height and indicate fresh snowfall. In the end, everything comes together. Ads are distributed at the right time across all channels with consistent and accurate messaging. This campaign has seen tremendous success improving customer loyalty and increasing ROI by 72%.